After a day of cycling, sight seeing or strolling around you will like to have a relaxing place to stay overnight. Therefore we arrange accommodation in cosy places, mostly family run hotels or guesthouses (en-suite bathroom). Those are selected for their location, hospitality and atmosphere. 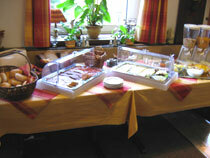 Here you also enjoy a rich continental breakfast in the morning. Over the day we provide you with healthy food and refreshment along the way (i.e. southern fruits, sandwiches and beverages). Our tours include dinner where local cuisine can, better: should, be discovered. That does not mean that you have to eat Schnitzel and Sauerkraut in Germany. Local gastronomy offers a wide range of delicious as well as meat-free dishes. For example at our Bavarian tours, you may start with a gorgeous salad, have sausages with potato dumplings and finish with a fresh home-made 'Apfelstrudel' as dessert. Of course our guides are happy to assist you on your selection, if needed.